After working with A LOT OF PEOPLE — both students and patients — over my 32-year career, I can safely say most of them who come to me with a health challenge, a crisis in their lives, a performance challenge or an inability to recover from an injury are overly trapped in themselves. There’re some techniques I use on a daily basis to help me stay connected with who I am. For starters, most people associate who they are with their bodies. However, they don’t realize that when they look into what their bodies are made of, it’s a lot of interesting things. Our bodies are made of the earth element which represents structure, like your bones or your large intestine which contains about 4 pounds of bacteria that behaves in very much the same way as healthy topsoil or compost. Our bodies are made of between 55-70 percent water, depending on how old and well-hydrated you are. Our bodies are air. We have to breathe to stay alive. We’re breathing air that could’ve come from anywhere in the world. We could even be breathing molecules that could’ve come from any number of the great wise people, be they Jesus, Buddha or Lao Tzu. Our bodies are fire. We are warmth and could not be here without the sun. The sun shows up in our bodies and our metabolism. Everything we eat is in some way dependent on photosynthesis, including plants that animals eat to survive. Current research says we replace every single cell in our bodies every year. People used to think it took seven years, but newer research says we are turning over every cell — about 100 trillion of them depending on whose book you read — every year. In a way, our bodies are like water fountains. If you’ve ever seen a large water fountain at a park, look at it from a distance it may appear as if it’s standing still, like an ice tree. As you move closer, you see how the water is moving and flowing. Imagine what the water fountain would look like if it were feeling trapped within itself and would never change without realizing that it’s forever changing, even as the water coming into it is being refreshed and renewed. Today, I’ll show you a very simple practice commonly used in native cultures to begin prayers to expand your self-awareness. Before you do anything, find the compass app on your mobile phone to locate where north is situated. If you’re paying attention to what direction you’re facing, you’ll realize there are directional energies. In this very simple exercise, you’ll go outside, stand in a relaxed position, pay attention to how your body feels, then begin turning your body slowly to notice if anything changes inside from an energy standpoint. Eventually, you’ll get to a spot where it suddenly feels like all of your energy is aligned. Check all of the other directions just to make sure. If you take your shoes off, you’ll feel that energy more strongly because it will connect you to the earth, enhancing the flow of your energy downward so your energy is circulating through you. When this happens, it makes you more sensitive because you’re more alive and vital. As you pull away from the alignment of energy, you’ll probably feel your chakras are being pulled slightly out of alignment. In this video, I’ll talk you through how I work with myself each day to expand my self-awareness outside of my body. By doing this, you become more able to experience yourself literally as everything… the moon, the sun, the stars. This has a deeper carryover effect because you start to realize you’re never really alone. If your life is very self-encapsulated, it can feel very heavy, hard and lonely. Also, I’ll show you how to move in your spirit body. It’s a simple thing you can do if you have a bed or bench in your backyard. It works better if you start by using places, objects and things you have a strong awareness of. If you can, visualize yourself stepping through the screen and standing here with me. Then visualize walking over with me to one of my favorite places at my Heaven House: Sitting on a piece of rock bathed in the warm sun as my body is swimming in a cool breeze in my back yard. By going through this process, you’re setting up neural circuits in your brain that organize the flow of energy and information in the very same ways you see athletes mentally preparing before competing. You’re opening up neural networks that facilitate the exact pathways all of us use. Not only do you feel a better sense of connection, you’ll create greater networks for connection so when you express it, you already have the hardware in place for the conscious experience to take place and manifest. You can use these same techniques when you’re working through your dreams too. You can begin to visualize yourself in that car or business or with that partner. Your only limitation is your belief system which can help you be healthy and stay connected or make you feel disconnected, sick and unhappy. 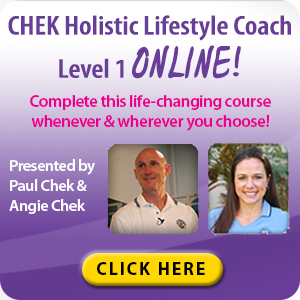 If you like this kind of work, you’ll enjoy my Holistic Lifestyle Coach Level 1 and 2 programs that take you much deeper into a variety of working-in techniques and show you ways to grow your consciousness, your sense of connection in your capacity to cultivate energy. 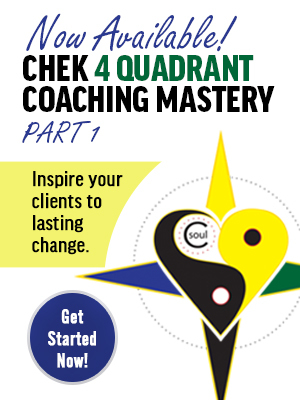 My CHEK 4 Quadrant Coaching Mastery program takes you deep into archetypes and healing wounds and blockages that prevent you from using your creative potential to its fullest. 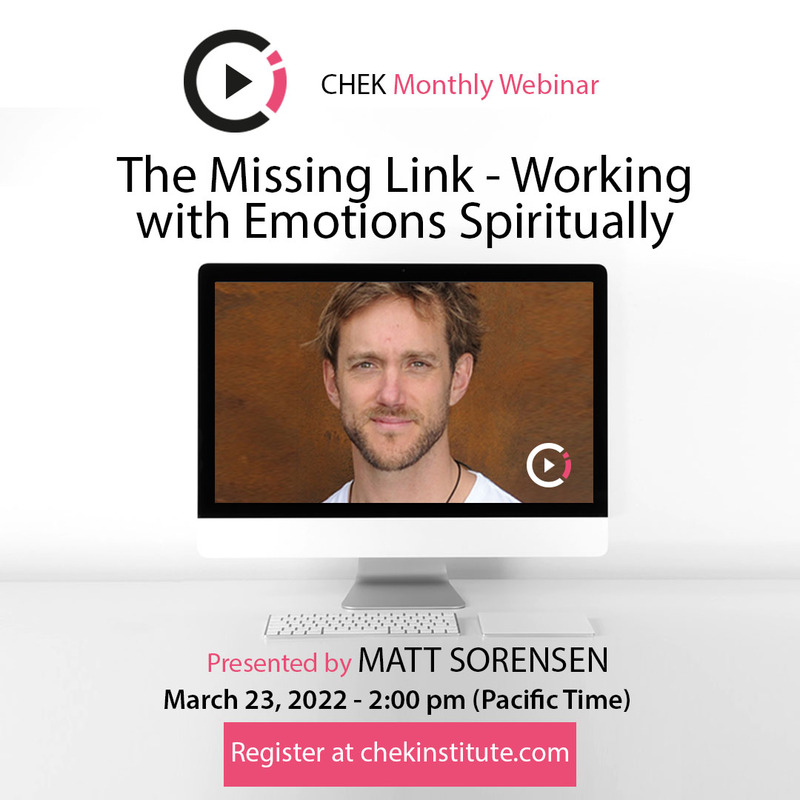 And if you enjoy this video, you will enjoy my next workshop, Zen in the Garden, which is happening in the San Diego area, June 9. Find out more about it here. I’d love to know how this technique is working for you!